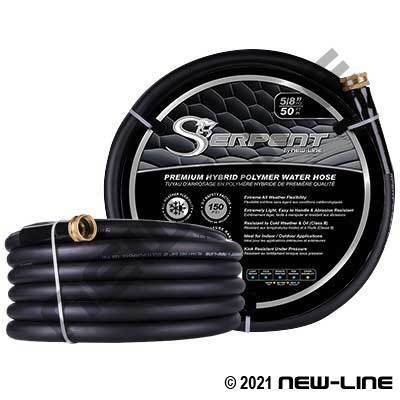 Serpent™ is an amazingly flexible abrasion resistant garden hose which provides a durable alternative to heavier rubber hoses. Serpent™ is priced similar to traditional PVC hoses but offers many advantages - seeing is believing. It is extremely light-in-weight, easy to handle (especially in cold weather) and provides superior abrasion resistance when dragged. In recent years the market has moved towards enhanced "food grade-safe materials" in garden hoses. We are doing a rolling change to these standards on the following colours only: Blue (NL1446), Pink (NL1442), Green (NL1445). Typical Fittings: Comes with standard brass male x female garden hose threaded ends with PVC bend restrictors at the fittings. Brass or nylon garden hose fittings, brass FBL ferrules, pinch clamps, gear clamps. N511/512/N400L/N176 Long barbs/Ferrules for larger sizes at higher temps/pressures. Construction: Tube: High grade, low-temp, hybrid thermoplastic polymer. Cover: High grade, hybrid thermoplastic polymer. Reinforcement: High tensile strength polyester yarn.